Everyone knows we sublimate woodgrain finishes to metal, but not everyone knows how we do it. Take a behind the scenes look at our process, and see how we create these super durable, authentic finishes on metals like aluminum and steel. Once we receive the parts, they are sorted, inspected, and hung on our production powder coating line where they are washed, pre-treated and then receive a proprietary polyurethane coating. 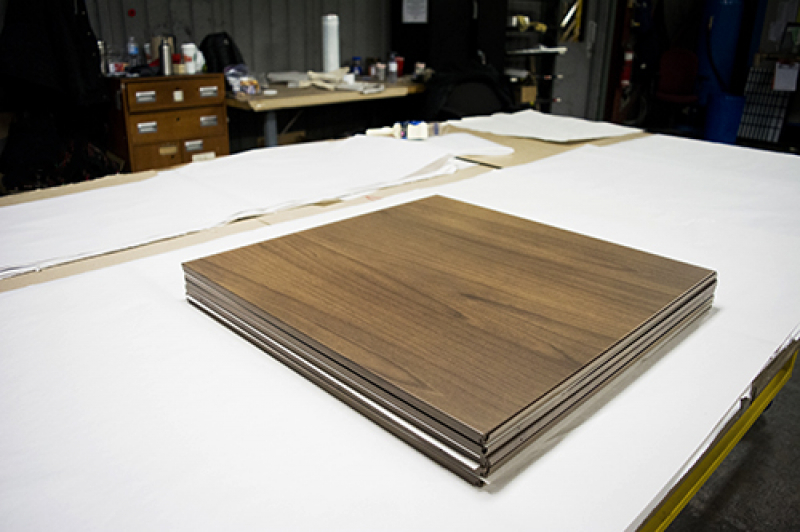 Below are powder coated aluminum panels, ready for the next step in the process - sublimation. Here we have the Decora team taping the proprietary poly film to the metal panels. These films contain UV stable inks and come in a variety of patterns and grains. From marbles to patinas, and of course wood, there is likely a finish that will help accentuate the beauty of any project. The wrapped panels are then placed on an aluminum table and covered by a Kevlar blanket. Using a vacuum, all of the air is removed from between the Kevlar and the panels, allowing for the film to be pulled tightly against the face of the part. The table is then rolled into the oven allowing for the sublimation process to take place. Once the temperature in the oven reaches 400F, the inks printed on the film turn to a gas state, and the powder coated substrate becomes porous. The air tight film in combination with the porous coating allows for a transfer to take place, in which the inks enter the powder coated finish. The base coat colour in conjunction with the transferred ink creates a beautiful, super durable finish comparable to no other. Here we see that the panels are taken out of the oven and inspected for any defects. The poly film is removed, revealing the transfer. This is how the panels look after being sublimated. They are hot, and need time to cool. Once the panels are cooled, the film is removed from the parts, and they are ready to be packaged and shipped back to the customer. After packaging and shipment, the project is complete!